TDD (Test Driven Development) was introduced to me around 2006 with PHPUnit. As a naive, I couldn’t see the benefits, eg., I saw the pattern of code has been updated very often (growing organically) and frequent failing test. I was like, Why should I write unit test to test my own code? with the same data I used for manual testing? As they say I was seeing the forest for the trees. I failed to realize the failing test is actually the benefit of practicing TDD. I feel little embarrassed to admit that none of my projects followed unit testing or automated unit testing. Because of the kind of projects and technology I use in my day job. To clarify all my projects was always extensively tested but manually. “The Specs” are always in either comment or in commit logs. Nowadays, I’m trying to introduce unit testing, automation/continuos integration wherever possible. I’m still learning, but I get the big picture now. Though my only coffeescript was an utility script which I wrote to test the water. 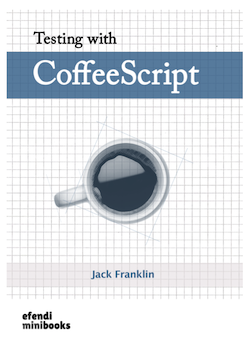 I got a chance to read this book on a weekend, it is only 50+ pages long and it explains how to practice BDD (Behaviour driven development) with Coffescript and Jasmine framework. Did I say, the author Jack Franklin is only 20 years old? Kids these days :-) It took half a decade and 20-year-old to put me to shame for not practicing TDD/BDD earlier. As they say, When in doubt always test.